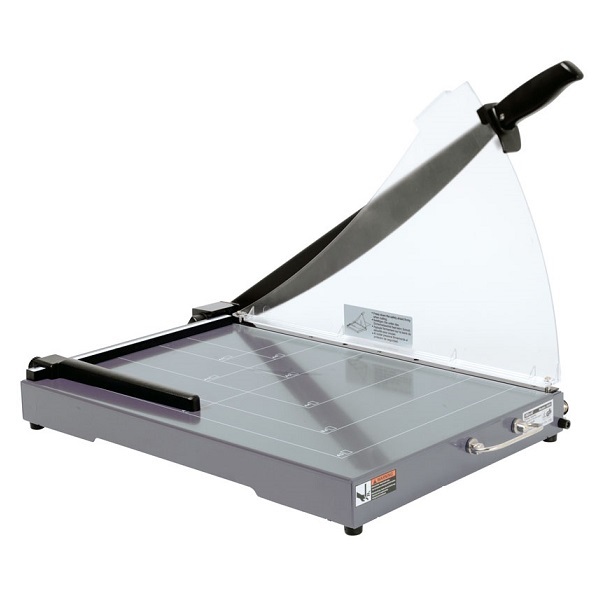 A Guillotine paper cutter (or Trimmer) is designed to slice through large stacks of paper in one smooth motion. They are so called because they have straight blades that fall on their targets from above... just like the infamous execution machines used during the French Revolution. A guillotine cutter is operated by placing the paper to be trimmed directly under the blade and on the surface attached. Once the paper is positioned correctly the blade can be deployed. 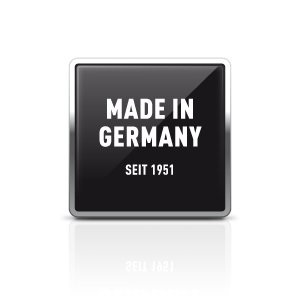 This is done by manually driving the blade downward to achieve the cut. Guillotines are ideal for high volume paper cutting. We can supply a full range of replacement blades, guards and other parts for most products listed below. Economy A4 safety guillotine suitable for Office or School use. Spring loaded manual clamp bar. Blade lock device. 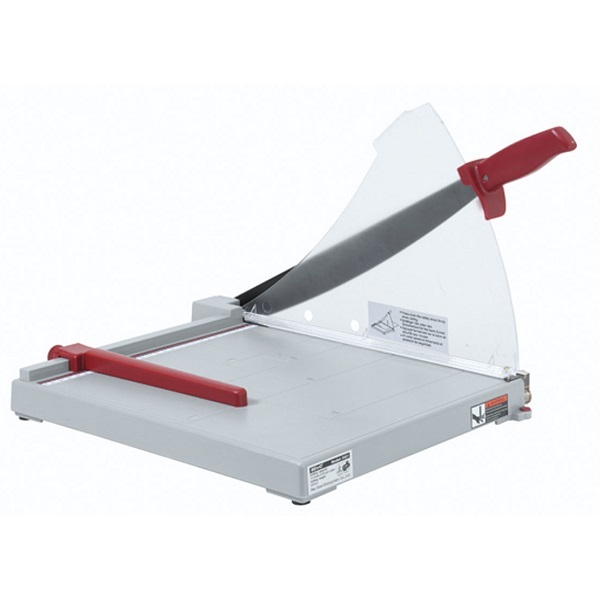 Economy A3 safety guillotine suitable for Office or School use. Professional A4 safety guillotine suitable for Office or Print Room use. Spring loaded manual clamp bar. 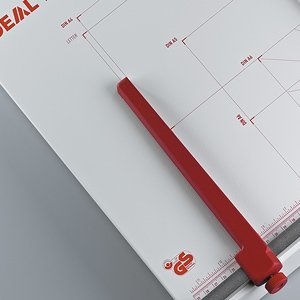 Cutting Capacity - up to 20 sheets of A4-size paper. Professional A3 safety guillotine suitable for Office or Print Room use. Cutting Capacity - up to 20 sheets of A3-size paper. 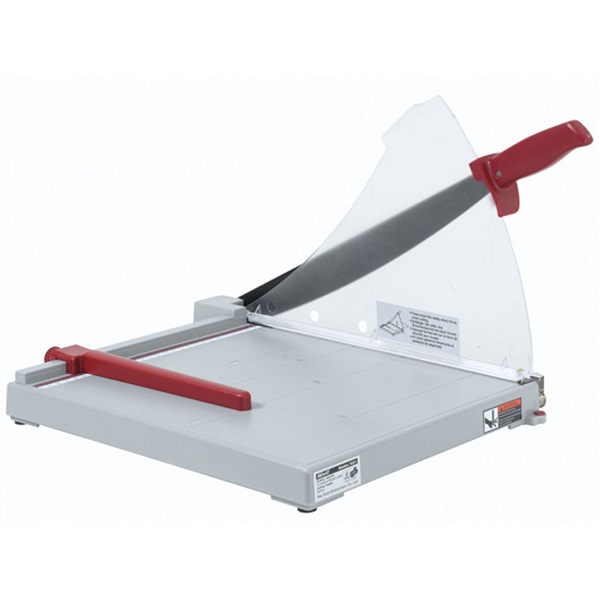 Premium European quality, compact A4 safety guillotine with Solingen steel blades. Solid all metal construction with a re-sharpenable high quality blade and strong blade mounting bracket. Manual clamp bar with stationary, transparent safety guard. Cutting line indicator for exact alignment of the material to be cut. Precision metal side lay and adjustable backgauge. Cutting Capacity - up to 25 sheets of oversized A4 paper formats. 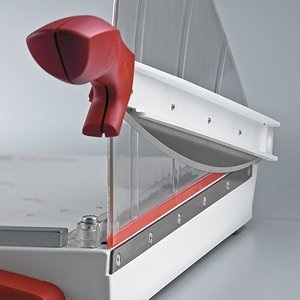 Premium European quality, innovative manual guillotine for A4 plus with automatic clamp and EASY_LIFT. Large cutting table with a solid all-metal construction. Resharpenable, high-quality blade set made of Solingen steel. Automatic clamp for precise and convenient cutting. 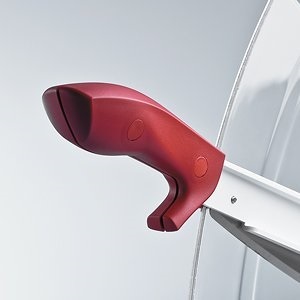 EASY_LIFT – the innovative release lever lifting the automatic clamp for easy removal of paper. Premium European quality, innovative manual guillotine for A3 plus with automatic clamp and EASY_LIFT. Cutting Capacity - up to 30 sheets of oversized A3 paper formats.